Contemporary Science Fiction / Dystopia - "Narrated by Kathy, now aged 31, she hauntingly dramatises her attempts to come to terms with her childhood at the seemingly idyllic Hailsham School, and with the fate that has always awaited her and her closest friends in the wider world." Mystery & Satire - "Nicola Six is searching for something and someone else: her murderer. She knows the time, she knows the place, she knows the motive, she knows the means. She just doesn't know the man." Modern Historical Literature - "Inspired by a real episode in Brazilian history, Mario Vargas Llosa tells the story of an apocalyptic movement, led by a mysterious prophet, in which prostitutes, beggars and bandits establish Canudos, a new republic, a libertarian paradise." Contemporary Fantasy/Spiritual Fiction - "Eddie is a wounded war veteran, an old man who has lived, in his mind, an uninspired life. On his 83rd birthday, a tragic accident kills him as he tries to save a little girl. He awakes in the afterlife, where he learns that heaven is not a destination, but an answer." Mystery Thriller - "Marriage can be a real killer. Nick's has been particularly troublesome, but one day his beautiful wife Amy goes missing and Nick suddenly finds himself as the number one suspect. But there are two sides to every story..."
I actually really disliked Never Let Me Go! I found it go hard to get into :( Glad you enjoyed it though. I have been meaning to read Never Let Me Go (along with about 1908908123 other books). I think I even downloaded the PDF of it which lies somewhere in the abyss of my computer hard drive. It was primarily motivated because I was going through an Andrew Garfield phase and I had downloaded the movie based on the book - which I also haven't watched. Clearly procrastination is my modus operandi. I'm reading Gone Girl at the moment, so far so good but even though it's not exactly boring i'm not finding myself wanting to pick it up and read it. I'm sure i'll finish it eventually though! I'm about half way through Gone Girl at the moment, I need to buckle down and finish it before my Kindle arrives. Really enjoying it so far & when I actually put the time aside to read it I can't put it down. Never Let Me Go is one of my favourite books. What struck me most was how devoid of dramatic emotion and description it was, yet when you reach the later stages and realise just what is happening to these characters, it really affects you as a reader. I think Ishiguro really mastered the craft of speaking about the human condition in a way that's so subtle but still so powerful. Love these mini reviews - I'm looking forward to reading London Fields and Gone Girl! You've summed it up so well - it really is a quietly powerful book and I can see why it's one of your favourites. When I finished it, I remembered just closing the book and thinking about the concepts for quite some time afterwards, which doesn't happen too often these days. 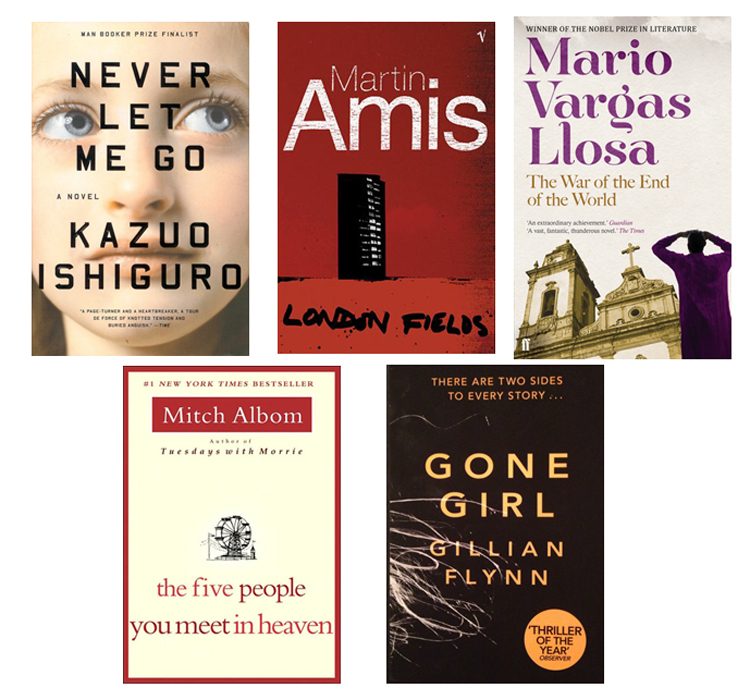 Enjoy London Fields & Gone Girl - let me know what you think of them! I've been wanting to read Never Let Me Go for a long time. It sounds like a very thought-provoking read. I love these book-review posts... thanks for sharing!